It is an uncommon practice to undertake long-term wet-weather flow (i.e., RDII and/or rainfall-runoff) simulations that may cover durations of up to 50-years or more using InfoSWMM H2OMap SWMM . 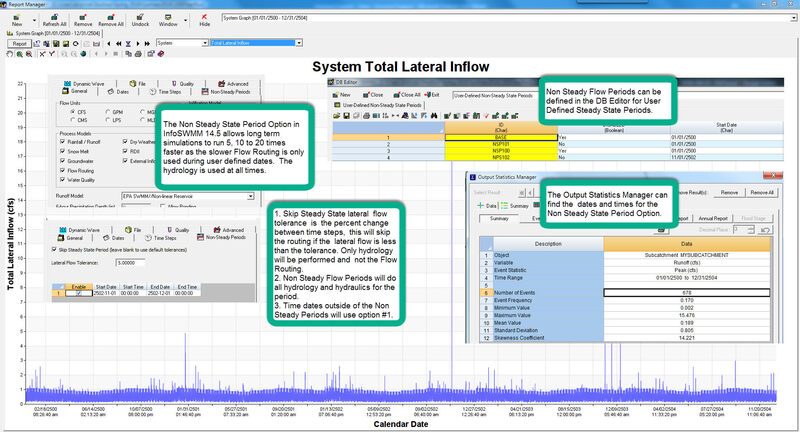 The wet-weather analysis integrates hydrologic simulation to generate runoff or RDII flow with hydraulic routing to convey the flow through the collection system. Depending on the complexity of the system and the desired accuracy, steady state, kinematic wave or dynamic wave routing may be used. Dynamic wave routing is robust and yields accurate results compared to the other two options, but it is computationally demanding, especially for long-term simulations. However, within the simulation duration there may be periods of no rain (i.e., dry periods). During these dry periods, there will be very little change in flow through the collection system implying that larger simulation time steps could be used for both hydrologic simulations and hydraulic routing without significantly affecting the simulation results. Therefore, a steady state assumption during dry periods within the simulation duration may improve the computational efficiency of the model. Several options are available to improve long-term computational efficiency. · Increase the tolerance in lateral inflow, node volume, and/or node depth change across simulation time steps to define the condition as steady state. If the change in lateral inflow or node volume or node depth is higher than the defined tolerance for any single node in the collection system, then hydraulic routing will be conducted, otherwise a steady state condition is assumed. · Ignore one or more inflow sources from the analysis. If the main interest is to conduct rainfall-runoff simulation, other inflow sources such as dry weather flow, external inflow, ground water flow contribution, or RDII flow may be ignored during the analysis. By doing so, the fluctuations in lateral inflow that may be exhibited during dry periods may be avoided thus improving computational efficiency. The added benefit of ignoring inflow sources is that one may develop different model scenarios each simulating the effect of one or more of the inflow sources on the system. This may help in analyzing the relative contribution of various inflow sources (e.g. RDII) to a point of interest such as treatment plants.